Vegan Nutritionista's Vegan Bytes #27-- Summertime and the Livin' is Easy! Welcome to the Vegan-Nutritionista.com insider group of subscribers! Our newsletter focuses on helping you learn more about veganism and how to apply it to your daily life. Vegan Bytes is dedicated to keeping you up-to-date with the world of food, answering your vegan nutrition questions, and providing you with ideas on ways to spread your lifestyle beliefs. *Question: "Where can I find GOOD vegan cheese?" *Question: "Will you start pooping more on a vegan diet?" *What's New? 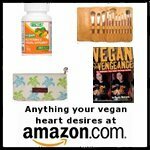 : What's new on Vegan Nutritionista? Remember, I write this newsletter and produce Vegan-Nutritionista to help you, so if you ever have a suggestion for a topic you want covered in the newsletter, please let me know. The Changes Are Gonna Come! I was absolutely blown away by the response from last month's survey. Thank you to everyone who participated-- it was incredibly helpful and probably one of the best things I've ever done with the site. I LOVED being able to learn more about who you are, what struggles you go through, and what you would like to see more of on the site and in the newsletter. What's really cool is to know that most of us are in exactly the same boat. I laughed out loud to see how many people wrote that their biggest struggle with veganism is "Cheese." Yes, mine was too! I could feel all your pain when you said you have trouble explaining your diet decisions to people, cooking/eating around non-vegan family members, and that eating out in restaurants is a real pain in the behind. I loved finding out that the biggest reason you all eat they way you do is because you want to be healthy, and also that you have a pure, unadulterated love of animals. The next most quoted reasons were because you don't want to support factory farms, are worried about the environment, and you are hoping to lose some weight. We are also going to start donating a percentage of our profits to charity. This has always been a huge goal of mine and I'm honored to be able to start doing that. If you'd like to weigh in on where you think our charitable contributions should go, you can give your opinion here. What that means is that anytime you (or anyone else) buy something from Vegan Nutritionista, it will contribute not just to the running of the site, but also to a globally worthwhile cause. I think these are some of the most exciting times since starting Vegan Nutritionista, and I hope you all love them too. ** For the success stories, I'd love to have volunteers from anyone who is courageous enough to have her/his story told on our website and newsletter. I would love to be able to post a picture of you, perhaps even a before/after of your transition to a vegan diet. If you are a little shy, but want to participate, we can always use just your first name, and even a picture of the shoulders down would work. If you'd like to participate, go to my contact page and send me an email. Where can I find GOOD vegan cheese?" Our June survey showed that most of us struggle to give up cheese, and if you fall into that category, I want you to know that you are not alone. To address the issue of cheese… you shouldn’t feel for a minute that you can’t quit cheese just because you have no will power. Back as far as 1981, The Wellcome Research Laboratories in N.C. found that cows produce morphine in their bodies, as well as codeine and other opiates. Those addictive drugs are in every part of their body, as well as their milk, and therefore, in cheese made from their milk. Recently, studies have found that the protein in cow’s milk cheese (called casein) is highly addictive. According to many studies, casein provides the same type of pain-relieving and addictive power as morphine, and cheese has the highest concentration of it. So, while it may be easy enough to stop eating milk and sour cream, cheese is probably still giving you a hard time. Add the addictive power to the fact that cheese just tastes so good, and it explains why so many of us struggle to stop eating it. You probably go through a difficult, guilt-laced spiral of having your mind telling you that a cow is suffering to give you that cheese, but your brain is sending signals through your body that you need to eat it, NOW. However, I do want to let you know that you can break that pattern, and after you break it, it’s not that hard to stay away forever. Just like any other detoxification from a drug, it will take some time and concentration. What I suggest is that you find a way to stop eating cheese for one full month, 30 days. If you can stop eating it for 30 days, you will start to change your body’s signals for casein. At that point, and not really before then, I suggest trying to add some cheese substitutes into places where you normally would have loved to have cheese. For instance, throw some meltable cheese onto your veggie pizza. Sneak some into a grilled cheese sandwich that has other things on it. Top your pasta with a scraping of vegan parmesan. The reason I suggest waiting to try vegan cheese is two-fold. For one, if you eat it while you are still detoxing from “real” cheese, your body is going to shout back at you, “That’s not real cheese!” And then, you will have a much harder time ever giving it up. Give yourself a chance and really detox off the dairy first. The second reason I suggest it this way is because we are so used to the taste of “real” cheese that, when we try something different, we automatically assume it’s bad. I freely admit that many of the vegan cheeses on the market are flat out ghastly, but there are a few special ones that are delicious. However, they are clearly different from cow’s milk cheese, and the longer you give yourself to forget about “real” cheese, the easier it is to accept “fake” cheese into your life. So, basically, the longer you take, the quicker it is. The two stand-outs in the vegan cheese world are, in my opinion, Daiya and Dr. Cow cheese. I highly recommend that you try these two cheeses. Even though both are a little pricey, we personally use them so slowly that they're a great value. You will have to learn to appreciate cheese in a different way than you did before, and therefore, rather than slathering it on every food source under the sun, you can just eat is as a garnish, as it’s meant to be. Daiya is a fantastic melting cheese, which makes it perfect for grilled cheese sandwiches, pizza toppings, quesadillas, and anything of that nature. I don’t recommend eating it specifically as a snacking cheese… that’s what Dr. Cow is for. The other amazing thing about Daiya is that it is made with no soy, gluten, rice, wheat, barley, nuts, or any non-vegan products, making it fantastic for people with allergies. It comes in a cheddar style and a mozzarella style, and we love both. Dr. Cow is your snacking, cheese platter, wine-and-cheese party, amazing cheese. It is made with nuts, so people with allergies might not be able to indulge, but for the rest of us, I definitely recommend getting a wedge to taste. Dr. Cow cheeses are aged and flavored with all-natural ingredients like seaweed, and I can’t say enough about their flavor. If you miss the flavor of aged parmesan, you need to have Dr. Cow. The wedges are small, and relatively expensive, but when I compare it to high-end cheeses, it’s about the same price per ounce. Check out my review of other vegan cheeses here. I hope this helps you to kick your addiction to cheese! The new summer vegetable meal plan ebook is available and is getting great reviews! It focuses on seasonal spring and summer vegetables like kale, lettuce, carrots, peas, strawberries, tomatoes, peppers, blueberries, and more! 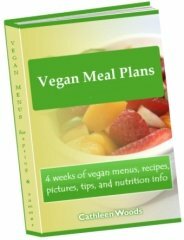 Just like in the original Vegan Nutritionista meal plans, the menus include 66 recipes for full dinners for 4 work weeks complete with nutritional information, tips, and many pictures. No repeats! 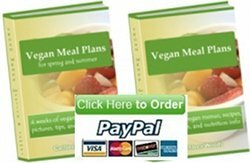 Get your Vegan Meal Plan for Summer, now for just $9.75. 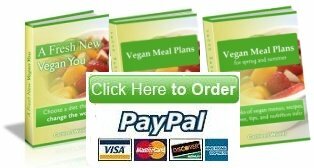 Get A Fresh New Vegan You, Vegan Meal Plans and Vegan Meal Plans for Spring with a free copy of the massive Vegan Grocery List for only $39.75. Save Big! Download this package here. "Why am I pooping so much on a vegan diet?" This was sent in to us by an anonymous reader, and I know some of us are squeamish about bodily functions, but since this is such a common situation, it's a great feature question for the week! What is going on with my poop? OK, sorry for asking the gross question, but it's really annoying me, and I'm trying to figure out if what I'm experiencing is normal. Now I'm in the bathroom 5-6 times a day, and my stool is very loose. Sometimes my stool is not formed at all, and sometimes it's formed but very soft. It seems like there's a lot more coming out of my body than going in. I'm going to the bathroom so much it's gotten painful. I'm hoping there is an end in sight and that my body will adjust, but it doesn't seem to be happening. Good for you dropping the dairy! Dairy products are highly addictive, so it's a big deal to be able to stop eating them. As far as the poops, it does sound pretty normal. Your body is getting rid of the waste left over from the cheese and milk, and getting accustomed to the increased fresh foods in your diet. Don't worry-- it will even out. It's hard to say how long it will take to level out from 5-6 times to a more regular schedule because it depends on your body and personal diet. Read the rest of my answer about how our bodies get rid of excess material here. Toast the almonds for 5 minutes in the oven at 350 degrees. Mix vinegar, maple syrup, mustard, and tarragon in a bowl. Wisk in the olive oil, and then taste to flavor with salt and pepper. Combine all ingredients in a salad bowl and toss to mix. The following pages are created just for Vegan Bytes Insiders... they are special hidden pages that only you can see, and it's my way of thanking you for reading each month. The following pages are password-protected and will require a password from you. This password will change occasionally and you will always find the most current password in the most current Vegan Bytes Newsletter. The one negative drawback to eating a vegan diet is that you often eat more fiber than the typical person. Doesn't sound negative, right? Well, it can be for your digestive system. Never fear though... I have researched and found several amazing, natural, chemical-free gas remedies. Like many websites, Vegan Nutritionista is constantly growing and changing, and if you signed up for this newsletter a long time ago, you might not have read our new information. Our blog page keeps you up-to-date with new articles on the site. Click here to go to our blog for updates on the site. We also now have a vegan forum where you can find topics submitted by users for discussion, answers, and places to add your own input. There is no member name required to participate, so you can jump right in and join in the discussion now. I am an affiliate for them, so anytime someone buys something from Vegan Essentials after using a link from our site, I make a small commission on it. But, I do promise that I would never recommend something that I don't use and love myself. So if you see a link to Vegan Essentials or any other company on our site for something you like, you can support their company and the running of Vegan Nutritionista as well, or you can always choose to go directly to the company. Comments? Feedback? Ideas? I'd love to hear from you. My website is here to help you, and I love to hear feedback on how to better do so. Just use my contact page and let me know what you think. Note: This is an auto-responder email so you can't reply directly to this email.